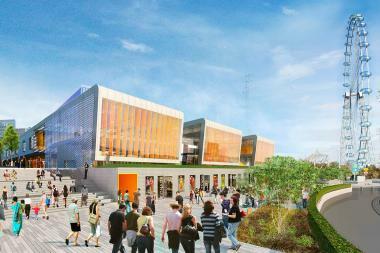 The state approved an additional $20 million resiliency grant for the under-construction Empire Outlets. ST. GEORGE — The under-construction outlet mall that will house Nike, Nordstrom Rack and Toys 'R' Us got an additional $20 million in taxpayer money approved by the state Wednesday. The state's Public Authorities Control Board gave the final approval for the resiliency grant to Empire Outlets at its monthly meeting Wednesday, Politico New York first reported. The board also approved Gov. Andrew Cuomo's $1.6 billion project to redevelop the James A. Farley Post Office into the Moynihan Train Hall, a spokesman for the state's Department of Buildings said. In January, the Empire State Development Corporation approved the $20 million grant for the mall — just weeks after the developer donated to Cuomo's re-election campaign — to improve storm resiliency at the waterfront Empire Outlets. A spokesman for the project did not want to comment for the story, but previously said it would only be used to improve infrastructure around the site, not the actual building or hotel. The for-profit outlet mall, under-construction at a former parking lot adjacent to the St. George Ferry Terminal, already secured $47 million in public funds and $66 million of the $350 million project has been paid for with state funds. From 2012 to 2017, BFC Partner Joseph Ferrara has donated $51,750 to Cuomo's 2018 run, according to state Board of Election records. The other partners of BFC — Brendan Baron and Donald Capoccia — donated more than $77,000 to Cuomo's 2018 bid between 2011 and 2014, according to records. Cuomo has previously been criticized for doling out taxpayer money to his biggest donors and a 2014 New York Daily News report found companies run by them received $15.2 million in grants from the state. His office did not respond to a request for comment for this story. The latest grant at Empire Outlets will go toward the three-level parking garage, new flood barriers and surge walls, a deck to protect Staten Island Railway tracks, new sidewalks, traffic lights and crosswalks, Sam Spokony, spokesman for BFC, previously told DNAinfo New York. “We are building new flood barriers, better roadways and Staten Island Railway improvements that will benefit all Staten Islanders and make commuting easier," he said in a statement. The Empire Outlets complex will bring 100 outlets stores, restaurants including the borough's first Shake Shack, a 190-room hotel and a parking garage to the waterfront. Developers expect to open it later this year.